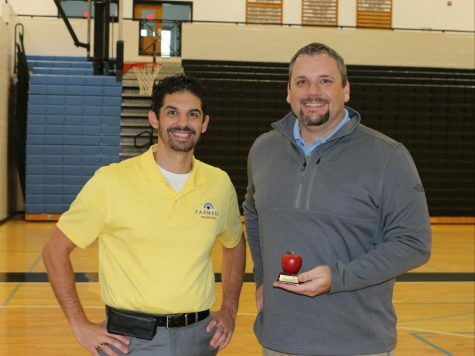 March’s Golden Apple recipient, Rick Wright, poses with Tim Monihan from Farmers Insurance. One of the most important things to Wright is that the students at Starr’s Mill have meaningful experiences during their high school careers. 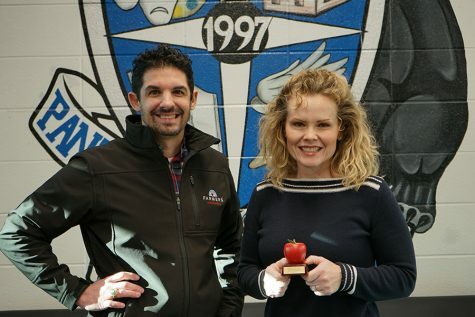 This month’s Golden Apple recipient, sponsored by Tim Monihan and Farmers Insurance, is Rick Wright. Wright is the Media Specialist at Starr’s Mill High School and has been working here for almost two years. 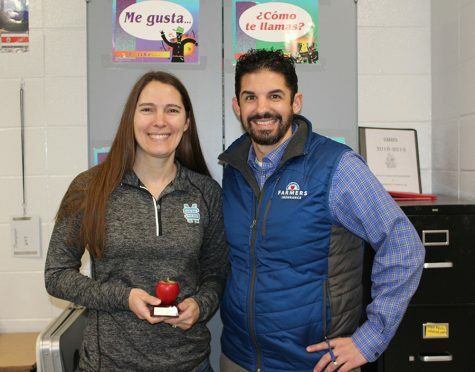 Wright was chosen as the newest recipient by last month’s winner Melissa Beaulieu, a biology and forensics teacher at Starr’s Mill. 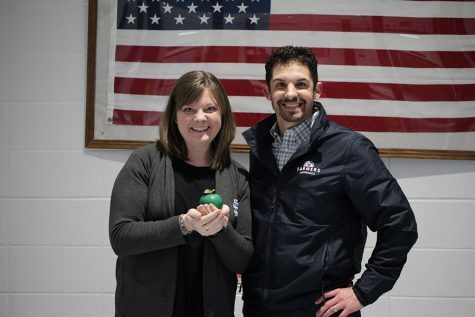 “He is so willing to go above and beyond to help the teachers with their lesson plans,” Beaulieu said. Wright believes in teamwork among teachers to help students grow as learners. 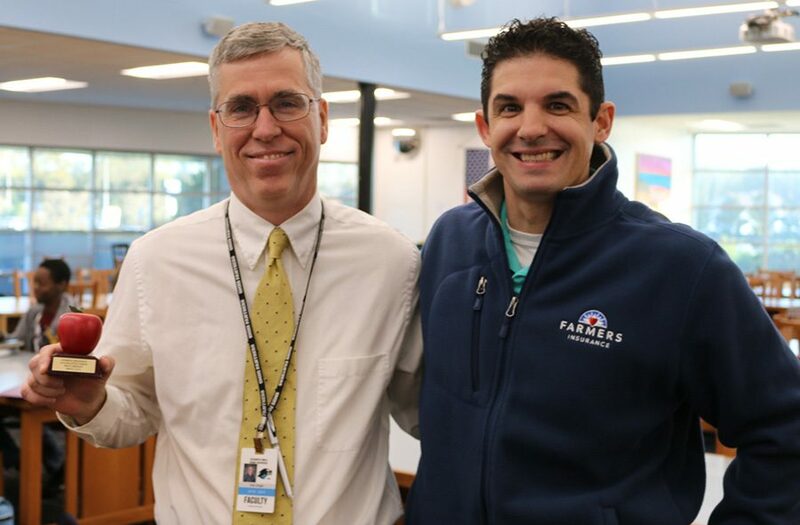 Through sharing technology and books that the media center offers, he helps create meaningful experiences for the students at Starr’s Mill. “Establishing relationships with the kids, it builds a positive dynamic,” Wright said. Being the Media Specialist, Wright is passionate about getting the students at Starr’s Mill more involved. He tries to create an environment for the students to be the best version of themselves. “My overall principle is to treat everyone like they want to be treated,” Wright said. With this principle, he tries to teach his students to not only be kind, but be lifelong learners and great problem solvers. He believes it is important for teachers to be interactive and connect with their students. “The more I know students and get along with them, the more things we can do,” Wright said. Wright hopes he inspires students by sharing interesting pieces of literature. In the future Wright plans to get his Google Certification, so he can seek out more resources for the students to use to make them even more successful. 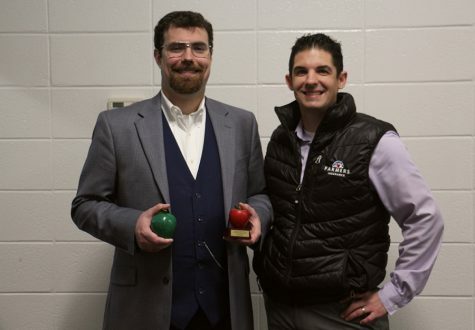 “It makes me excited to see a student take an idea I have put out, take it seriously, and produce something cool that they get excited about,” Wright said. Wright plans on using his $100 award, gifted to him by Tim Monihan and Farmers Insurance, to buy more supplies for programs already at the school, and to make Starr’s Mill more technology friendly.